There were three big takeaways from Photokina 2018. Firstly, everyone has (finally) embraced full-frame mirrorless. Secondly, medium format is a big thing. And thirdly, more and more lenses are breaking the generally accepted speed limit. Sony was quick to rubbish the notion of larger mounts at its press conference (projecting a giant slide with the words, “Does a large-aperture, high-quality lens require a large mount diameter?”, followed by a slide in much larger type, “The Answer is ‘No.’”). But this didn't stop manufacturers, with mounts great and small, introducing lenses with wider maximum apertures than usual. Wide open apertures enable us to shoot in the near-dark or melt a background into a buttery bowl of bokeh, so having a super-fast lens is something that every photographer wants. No surprises here – the fastest gun in the west is Nikon’s monster of a lens, the f/0.95 Noct, designed exclusively for its mirrorless Z cameras. It’s got all the mod cons befitting the company’s flagship S line: Nano Crystal Coating, Arneo Coating, flourine coating… and it has to be said, it looks absolutely killer with the stylised “Noct” script in electric yellow on the side. All that said, there is one massive asterisk next to this lens: it’s manual focus only. If you’ve ever tried to focus the cigarette paper-thin depth of field on an f/0.95 lens with manual focus alone, you’ll know what we mean. If you haven’t, or if you don’t care, and you’ve got (according to the grapevine) about $6,000 to spare, you’ll be taking some bokehlicious photos. Better buy a back brace, while you’re at it, because this lens is one big boy. Arguably the star of the show, following its stonking press conference that announced approximately 1,000 cool new things (despite being longer than Lord of the Rings and with a similar amount of endings), Fuji came out guns blazing with a crop of new XF lenses. 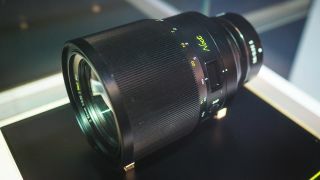 Its biggest gun was undoubtedly the 33mm f/1.0, which Fuji unsurprisingly promises will deliver incredible image quality. And here’s the game changer about this lens: it has autofocus. Sure, it may be a step behind Nikon’s Noct in terms of aperture speed. In terms of shooting speed and actual use, however, this lens is going to be so much quicker and easier to use. Given the choice, we’ll take an f/1.0 AF lens over an f/0.95 manual lens – we kinda like having all our images in focus when we put the memory card on the computer. When we heard that Zenit and Leica were teaming up to make a camera, we genuinely had to check the calendar to see if it was April already. And when we were told that the lenses were going to be “pure Russian” design, we weren’t sure what to expect. Zenit is, after all, best known for slightly creaky lenses you can get on eBay for a few quid when you’re in your vintage lens-buying phase. Colour us impressed, then, when we realised that it was a whippet-quick 35mm f/1.0 – one that tag teams incredibly well with the new Zenit M. Yes, it’s manual focus, but no we don’t mind in this case – the Zenit M being a rangefinder and all. Panasonic may have given all appearance and indication that it was leaving Olympus in the lurch with the micro four thirds format, but it remained insistent in its commitment to the system. And, having revealed this lens, people should probably stop poking fun. “The World’s First Full-range f/1.7 Wide Zoom Lens”, the PanaLeica 10-25mm (20-50mm in 35mm terms) is a constant aperture f/1.7 lens – quite a feat in and of itself, let alone a feat achieved on the much smaller Micro Four Thirds lens mount. Perhaps Sony was onto something with those slides, after all. This Summilux lens was a win in an otherwise fairly painful show for MFT users. Hopefully Olympus will give them more reasons to cheer in the new year. It may be the slowest lens on the list, but the “XCD 1.9/80” is the fastest lens that Hasselblad has ever made. Not that f/1.9 is slow, by any measure; it’s still a lightning quick lens, and paired with the mirrorless Hasselblad X1D-50c you get seriously stunning results that enable the body to keep up in low light situations. Paying $4,845 for an f/1.8 lens may still be a bit painful, but if you’re shooting on a Hassy then the chances are you probably won’t blink at the price.